Exquisite double glazing for your Farnham home, including double glazed windows, doors, and conservatories, as well as roofline products. Competitive double glazing prices for high-performing products to give you great value for money. At Hart Windows, we make it our mission to give homeowners in Farnham and the surrounding areas the best possible double glazing solutions and products. Our product range is designed to fulfil all your needs. We offer a beautiful selection of double glazing windows, doors, conservatories, glass cut to size, and roofline products tailored to give you fantastic performance. In addition to the extensive design selection, we also offer a spectacular selection of materials to choose from. Whether you want aluminium windows, composite front doors, or uPVC conservatories or orangeries, you will find them with us. You also get amazing customisation options for your double glazing needs. We give you a choice of stunning colours and finishes. These include standard as well as bespoke options. You can even get a wood finish for your double glazing. As a result, your uPVC or aluminium double glazing looks like authentic wooden fittings. This is a great option for you if you have a heritage property. You get the traditional look but with modern functionality. Hart Windows is known in the Farnham area and surrounding places as the best double glazing company for your replacement windows and replacement doors. We have built this reputation through reliable double glazing installations and top quality double glazing products. Get in touch with us for double glazing solutions at a competitive price in Farnham. We have a wide selection of window designs and styles from which you can choose. Our double glazed windows are carefully selected to cater to every need and demand. If you need a timber aesthetic for your Farnham property, we offer premium engineered-timber windows from the Residence 9 collection. These windows give you the elegance and style of wood with the modern performance of modern windows. If modern sleekness is what you desire, we have a gorgeous range of aluminium windows. These slimline windows give you superb durability and strength along with the clean and contemporary lines to enhance your Farnham home. With our uPVC doors from Liniar and Rehau, you get robust doors that will refresh the visual appeal of your home. These double glazed doors come in a range of designs and styles, all of which can be tailored to suit your needs. We also offer a vast selection of composite double glazed doors from names like Solidor, Door Smart, Endurance, and Visage. Our range of double glazed aluminium doors is designed to give you minimalist frames with larger glazed areas. You can give your Farnham home a facelift with our aluminium bi-fold doors. However, if it is traditional timber you want, we also have the Residence 9 collection of engineered-timber doors. Our range of double glazed extensions is designed to extend and enhance any Farnham home. We offer a stunning selection of conservatories and orangeries in various designs, so you can find the one that blends in with your property seamlessly. These double glazed conservatories and orangeries will assuredly give you fantastic heat performance as well as durable security. This way, you not only get an extra room to use as you please but also improved features for your property. These extensions can even be styled as per your wishes. In addition to colour options, you can also choose the kind of windows and doors you want for your glazed extensions. In addition to double glazing, we also offer roofline products to help your home look stunning from the outside. These fascias, soffits, and guttering also help the way your home performs and functions. These roofline products help improve the ventilation, drainage, and the appearance of your Farnham home. 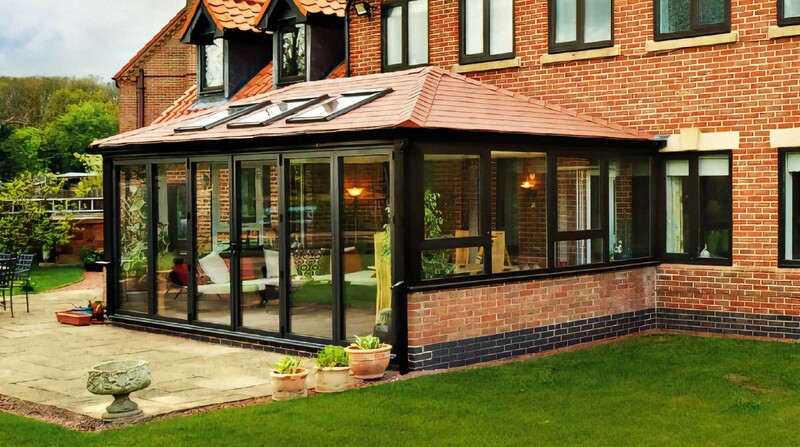 We also offer striking tiled and double glazed conservatory roofs from Synseal Global and Atlas. These replacement conservatory roofs are ideal for refreshing your extension in a cost-effective manner. Finally, you can improve the lighting and ventilation of your home and extension with our selection of roof lanterns. Our double glazing installation quality is consistent with the highest standards. We have over 30 years worth of customers who can vouch for that. We are also certified members of FENSA. As a result, you get the double assurance of our reputation and the regulatory body’s accreditation. As part of our dedication to quality, we ensure that your double glazing gives you optimal performance. Whether it is an aluminium door, modern composite window, uPVC conservatory or orangery design, we strive to give you high thermal performance, superior weatherproofing, and security features. Our double glazing is designed to help keep your home warmer and drier, even in the most inclement of British weather. Our windows, doors, and double glazed conservatories help retain the heat better so that your home stays warm even with lowered usage of the central heating. Additionally, our expert double glazing installation also gives you better weatherproofing. As a result, your home will never suffer from cold draughts, rainwater seepage, or damp. This will give you a warm and comfortable home that you can enjoy all year round. In order to maintain our impeccable industry standards, we maintain a team of skilled workmen. Our installers all have years of experience, combined with regular training. As a result, we have some of the best double glazing installers in the industry. Our workmen are motivated and as dedicated to customer satisfaction as we are. This is why they give you safe and secure installations. They treat your home with respect. During the installation, they keep clutter to a minimum. They also maintain all security protocol so that your home remains safe. In case you have children or pets, they ensure that their safety is paramount. They don’t leave tools lying around. Moreover, any unsafe areas are duly cordoned off. What’s more, once the installation is complete, they tidy up after themselves. Our customers in Farnham have a wide variety of needs for their home improvement. This is why we try to make sure we have something for everyone. As a result, you can get a full spectrum of double glazing products from us. No matter what your style and aesthetic, you will find something perfect for you. We have a stunning range of designs in uPVC and aluminium windows. We even offer engineered timber windows from Residence 9. Our range of doors is also quite extensive. We offer multiple styles like French doors, aluminium bi-fold doors, sliding patio doors and more. You can get attractive composite front doors. We even give you stunning uPVC conservatories for your Farnham home. What’s more, you can also choose from our roofline offerings to get a completely bespoke look. We pride ourselves on our superior products and services. Moreover, you get them at extremely competitive rates. We deliver excellent product quality with a prompt and reliable installation. The best part is, we do so without having to resort to extortionate prices. From the time you begin making your selection till the time your installation is complete, you get stress-free, market-leading service. We help you make your selection, so that you get the absolutely best possible option for your Farnham home. We make sure it is delivered in time, and then installed as per regulations. When you consider how easy we make it for you, you can see how amazing our pricing is. How Much Does Double Glazing Cost in Farnham? As you can see, our double glazing services are of the highest standards, but at amazing rates. To find out your personalised double glazing quote, simply go to our online quoting engine. This tool allows you to enter your needs, and it will generate your quote within minutes! Alternatively, you can contact us online or call on 01252 623404 to speak to someone from our team. They will answer any questions you may have and give you a double glazing price for your home.